The Press has unique wedge design helps specimen clamping, perfectly parallel to the grinding disc ensures uniform lapping/grinding. The Press method for ensuring that the metal surface is exactly perpendicular to the optical axis of the microscope. This provides a simple and perfect method for parallelism of the specimen Surface perpendicular to the optical axis of themicroscope surface can be carried out without frequent focusing. This provides a simple and perfect method for parallelism of the specimen surface perpendicular to the optical axis of the microscope surface can be carried out without frequent focusing. 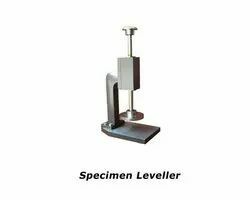 Specimen Leveller - for Precise Levelling of Sample for Uniform Focus during inspection with Upright Metallurgical Microscope. All Cast Body with Precision Machined Flat levelling Face with Spring Loaded operating Handle.